The terms RV and motorhome seem to be used interchangeably. This leads many people to wonder, is an RV the same as a motorhome? What’s the difference between RVs and motorhomes? The term RV is just an abbreviated way of saying recreational vehicle. A motorhome is a form of a recreational vehicle which means that all motorhomes are RVs but all RVs are not motorhomes. Is a Mobile Home an RV? Is a Tiny House an RV? Here is the legal definition of an RV according to HUD. As you can see, this definition can include a whole host of vehicles and they don’t have to be self-propelled like a motorhome. Different states will also have different standards to determine whether or not something is indeed an RV. For example, the state of Pennsylvania states that anyone looking to legally register a van as an RV must install a permanent bed as well as a kitchen. A permanent desk can be substituted in for the permanent kitchen. In the state of Oregon, “The DMV defines a camper as a structure that isn’t permanently attached to the vehicle but is mounted on the vehicle, has facilities for habitation, and is at least 6 feet long and at least 5.5 feet high (floor to ceiling). A camper has no more than one axle to support the total weight of the structure”. Notice the common trend is that there need to be sufficient living accommodations within the vehicle for it to be considered an RV. A motorhome is a type of self-propelled RV. This is where the term “motorhome” comes from as the home literally has a motor built into it. There are three distinct types of motorhomes that you can buy. Class A motorhomes are large vehicles built on tractor-trailer platforms. These vehicles are very popular among people looking to live in an RV for extended periods of time. A class A motorhome can often be used as a towing vehicle to tow cars, boats, and even other RVs behind it. You can read more about how to tow a car behind a motorhome on our Complete Guide to Tow Cars for RVers. Class C motorhomes are also quite large and can be lived in full-time as well. These vehicles are built on full-size truck platforms. A class C motorhome will often have a cabover sleeping section which allows for more sleeping area than the other types of motorhomes without adding an additional length to the vehicle. Class B motorhomes are smaller than their class A and class C cousins. These motorhomes are great for long travels and quick weekend vacations. A class B motorhome is usually the most fuel-efficient type of motorhome and it is often small enough that it does not need to be stored in a special location like a class A motorhome might need. For more information on each type of motorhome, please visit our post titled, “Class A B & C Motorhomes: Understand the Differences“. Towable campers are structures that are built on top or within trailers. These RVs are not self-propelled and you’ll need a motor vehicle to transport them. A pop-up camper, also known as a PUP is a camper that folds down while in transit. This type of camper is easier to tow than the other types of campers and can be extended to provide the same amount of interior space upon its arrival at its destination. Most pop-up campers have walls that are made of canvas but you can find hard-sided pop-up campers. Some examples of hard-sided pop-ups are the Trail Manor camper and the Hi-Lo camper. These campers are sturdier than canvas pop-up campers because there isn’t any canvas to be torn or damaged. Foldable campers are campers that fold down for towing. In most cases, the roof will be lifted with struts or springs and each of its four walls will be lifted into place underneath of the roof. Here’s a photo of the foldable camper when folded down and ready for transport. These types of campers can provide a lot of interior headroom when folded out and can provide a very low platform for towing while folded up. Some examples of foldable campers are the A-liner and the Gobur folding caravan. A foldable camper is great for touring or for frequent travels where tow-ability is a major concern. However, people looking to buy campers that will sit in one place for months at a time will usually opt for a trailer that does not fold as folding caravans are typically not as well insulated. Campers built on top of trailers can range in size and weight but they’re typically heavier and larger than pop-up campers. This type of RV can be built with full-time travel in mind or it can be built as a weekend getaway vehicle. In most cases, campers built on trailers will have a bedroom, a kitchen, a bathroom, and a dinette. Larger trailers may have multiple bedrooms as well as a living room. You can find large trailers with slideouts that rival small apartments and mobile homes in size. A toy hauler is a type of camper that provides living quarters as well as a means for towing ATVs, golf carts, motorcycles, snowmobiles, go-karts, and even small cars. This type of camper usually has fold-up beds that can fold into the sides of the camper so that vehicles can be driven into them. 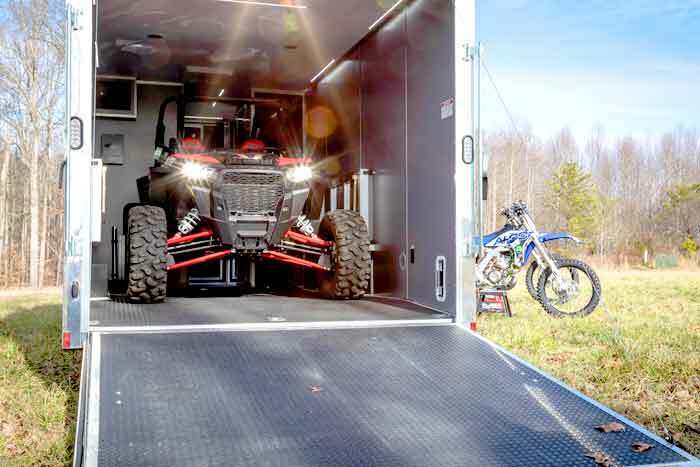 A kitchen and a bathroom are usually built into the front of the toy hauler. The advantage of this type of RV is that you essentially have a mobile garage that you can live in. A fifth wheel camper is a camper that can only be towed by a pickup truck. This type of camper is also built on a trailer. The difference with a fifth-wheel is that part of the camper is designed to fit over the top of the truck bed. This design makes towing easier and places some of the living quarters overtop of the truck which reduces the overall length of the vehicle and the RV. The drawback to this type of camper is that it cannot be towed without a pickup truck and special equipment usually needs to be mounted to the inside of the truck bed to allow for towing. This means that the truck bed cannot be used for storage while the camper is being towed. A truck camper is an RV that slides into the bed of a pickup truck. These can be strapped onto the truck or they can be bolted down. A truck camper can have a cabover that fits over the top of the truck’s cab or it can start and end within the bed of the truck. This type of camper can also come in the form of a pop-up camper and you can buy them in canvas styles or hard side styles. They might also be built as a permanent Truck RV where you cannot remove the camper cap from the truck. The advantage of a truck camper is that this RV does not need to be towed. It is also typically short enough that it can be removed and stored inside of a garage. No, a mobile home is essentially a pre-manufactured home. A mobile home is built with the intention of full-time living without frequent travel. This type of home can’t be towed by the average homeowner as a tractor-trailer needs to be used to tow a home this large. Additionally, these homes are meant to be moved once and then permanently placed at a location. In fact, often-times the trailer’s tongue is removed upon arrival. This makes the home difficult to move as the tongue would need to be added and a moving service would need to be used to complete each move. A tiny house is an RV if it is built small enough that it can easily be towed like a camper. However, a tiny home can also be built more like a mobile home and it can be lived in full-time in all four seasons. The main advantage of a tiny home is that it can be custom built to meet the needs of the buyer. A tiny home could be built light enough to be used as an RV while simultaneously providing enough insulation so that it could be used as a more permanent residence as well. People who like to move every six months to a year are the best candidates for tiny homes.